Mayank Goswami Cricket Academy is the finest cricket academy in Jammu and kashmir. And its results have been unmatched in the past 10 years of its existence. Their students have excelled in every age category and very often are captains of state. - Mgca has more than 8 coaches. Far more than any other academy in the state. -Mgca produced the 2 YOUNGEST Ranji trophy cricketers this year. -Our student emerged as the highest run getter in the History of J&K cricket in any age category. - 2 of our students signed contracts with AIR INDIA and ONGC respectively. -Bat manufacturing giant SPARTAN Signed one of our students as their brand Ambassador. - Mayank Goswami cricket Academy now has 2 CENTRES OF EXCELLENCE, in MUTHI and NANAK NAGAR respectively. Dr. Atul Gaikwad (coach of SACHIN TENDULKAR'S son and Indian Women's cricket team captain MITHALI RAJ. Dr. Gaikwad is a PhD and a double LEVEL 3 coach from India and Australia). Mr. Sukhwinder Bawa (Coach of legendary YUVRAJ SINGH). Mr. Madan Sharma (coach of current India opener and star SHIKHAR DHAWAN). Mr. Manjeet Singh (One of India's most senior coaches). Their players are producing some Amazing results. (Madan Sir). 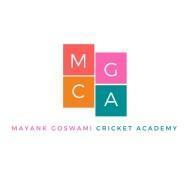 Mayank Goswami Cricket Academy conducts classes in Cricket Coaching. It is located in Muthi, Jammu. It takes Regular Classes- at the Institute.